"The Man Who Broke into Auschwitz" is the product of a conspiracy to defraud. Last year, I wrote an article published here about Denis Avey, a man whose newly-released WWII concentration camp survivor story was getting a lot of attention in the British press. In my article, and on my Internet radio program The Heretics' Hour, I did a pretty thorough job of debunking Avey's poorly concocted story and explaining the intention of the Yad Vashem Institute and Memorial in Israel to name him one of their "Righteous Among the Nations," an award they give to Gentiles whom they document as saving the life of a Jew during "the Holocaust." Now Avey has come out with a book, The Man Who Broke into Auschwitz, which immediately became a best-seller (so they say) in the UK, but has not been released yet in the U.S. The book is co-written with Rodger Broomby, the BBC journalist who interviewed Avey for the article that started the whole ball rolling. It ran in the BBC online edition Sunday, Nov. 29, 2009. Because Avey's basic story has already been thoroughly critiqued by me and others, I will now focus attention on the principals who conspired to create this hoax on the public by building up, even encouraging, the ridiculous tall tales of an old WWII veteran. Unfortunately this is nothing new in the Holocaust Industry, but this should not lead us to believe that familiarity makes it acceptable. It is not. We also need to understand that these are not just harmless stories, and think we can afford to humor old men and women who indulge in them. These are harmful lies, and also distortions of history, that slander certain people and whole nations, even to the point of destroying once healthy societies. It is, in fact, a type of warfare—what's called Information Warfare. The BBC first heard about Denis Avey in 2003 when he appeared on a BBC program discussing war pensions. He began to speak about Auschwitz, where he said he had "come to witness", calling it "like hell on earth." As he continued, the TV hosts could hardly believe what they were hearing. Reportedly, the BBC began production on a documentary about him, but sat on this story for six years, during which time they discovered the story of the Jew Ernst Lobethal, who had testified on videotape to the Shoah Foundation in California before he died in 2001. Much has been made of the connection between the two men, but it has never been satisfactorily authenticated. We have to assume that the BBC did its journalistic job and carefully looked at the story presented by Denis Avey. They had to see the implausibilities in it, most especially the change of uniforms between Avey and the "Jew" as their separate marching columns passed each other. This preposterous fantasy is what makes Avey's entry into the Jewish barracks possible. They also had to know that a similar story had already been concocted by another British subject—Charles Coward—right after the war, and a motion picture had been made about it. We are thus led to the assumption that BBC fell victim to that "if it worked once, it will work again" Hollywoodish penchant to repeat past hits. This makes it clear that the BBC knew it was dealing with a fraud, but cared only whether or not it could be "sold" to the British public, who are quite willing to "buy" German atrocity stories. Even the knowledge that the Charles Coward story has been widely discounted in recent years did not cause the BBC to exercise restraint. We turn now to the connection to British politics. Back in 2005, Chancellor of the Exchequer Gordon Brown (in Tony Blair's government) made funding available to send, each year, two teenagers from every British secondary school on a visit to Auschwitz. The funding has been extended to 2011. According to the UK Telegraph, Brown's interest in the "Holocaust" went back to his childhood, when his clergyman father worked with a church group that supported the foundation of the state of Israel. In Feb. 2008, Tory candidate David Cameron called Brown's school kids' Auschwitz trips a "gimmick." This backfired on the Tories, strengthening Brown's belief that being pro-Auschwitz was good public relations and good politics. Following upon his elevation to Prime Minister, Gordon Brown made a highly publicized "emotional" visit to Auschwitz on April 28, 2009, when he also met with the Polish premier and president to discuss deployment of Polish troops in Afghanistan. The BBC carried the news that Brown said the UK government would do all it could to assist school visits to Auschwitz, and on April 30, the Prime Minister pledged to increase the number of school pupils who visit the concentration camp memorial yearly. He also pledged support to maintain Auschwitz as a permanent memorial amid concerns the site is in a state of decay and funding for its museum is under threat. British "Heroes of the Holocaust"
When Prime Minister Brown returned from his Auschwitz trip, he announced the creation of an award to recognize British citizens—something he named "Heroes of the Holocaust." A campaign to gain official posthumous recognition of British Holocaust rescuers had already been initiated by the Holocaust Educational Trust (HET), a British "charity" founded by British Jews in 1988 to ensure that the Holocaust formed part of the National Curriculum for history. Through 2008 and 2009 the campaign attracted support from the media as well as members of parliament, both in the UK parliament and in the Scottish Parliament. This new national award was announced on 29 April 2009, just after Gordon Brown's first visit to the Auschwitz-Birkenau concentration camp in Poland. Brown had proclaimed at that time: "We will create national awards in Britain for those British citizens who helped so many people, Jewish and other citizens, during the Holocaust period." When Prime Minister Gordon Brown launched his "Heroes of the Holocaust" awards in 2009, it seemed a good time to bring out Denis Avey, dust him off, and present this very-much-alive "Hero" to the British public. Thus the BBC got busy arranging a meeting between Ernst Lobethal's sister, who had been sent as a Jewish child to England in the late 1930's, where she remained, and Denis Avey.1 The meeting was filmed and presented on BBC-TV, as well as on BBC-Online on Nov. 29, 2009, exactly seven months after the "Heroes" announcement. 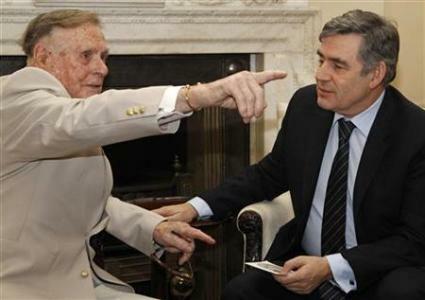 Two months later, Gordon Brown received Avey at 10 Downing St. in London, sat and talked with him and later awarded him, along with 26 other recipients, the British Hero medal. 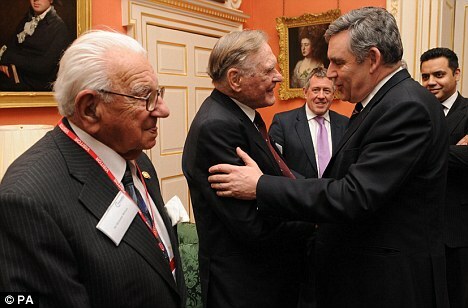 'Great bravery': Gordon Brown greets 91 year-old Denis Avey at the awards ceremony, while 100-year-old Sir Nicholas Winton stands nearby. These are the only two living recipients of the award. 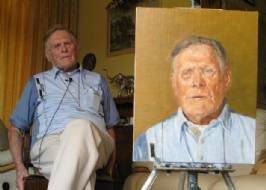 The International Raoul Wallenberg Foundation has commissioned painter Felix de la Concha to create a portrait as well as conduct an interview with Denis Avey, a man who "smuggled" himself into Auschwitz. The interview is a part of a bigger project aimed at portraying and recording Holocaust survivors that Mr. De la Concha has been carrying on since 2008. Another conspirator is Yad Vashem. The folks there were all set to award Avey with their "Righteous Among the Nations" title, and it is only in the past weeks they started to express second thoughts. There is also Pulitzer Prize-winning Jewish journalist Henry Kamm, a correspondent for The New York Times, who endorsed Avey's book with unqualified admiration for the man, and Jewish historian Sir Martin Gilbert, who wrote the forward, calling it "a most important book." A serious problem here is that all of these people are intelligent enough to see that Avey's story is false on its face. They go along with the lie as a matter of course. The entire Holocaust business is rife with absurdities which no one can challenge without being heavily persecuted, if not arrested. Therefore they feel safe. "The Holocaust" is a political asset that is used to gain, hold and justify power. It is therefore guarded with big guns. But once in awhile something is just too bizarre to pass. On April 9, 2011 Guy Walters wrote in the Daily Mail that Avey's story is not believable. But a year before that, this was pointed out by the blogger at Scrapbookpages Blog on March 4, 2010, and then on my radio program mentioned above on March 8, and my article published at Inconvenient History Revisionist Blog on March 16, 2010. Guy Walters happens to be the author of Hunting Evil, a biography of Simon Wiesenthal that exposed the famous "Nazi Hunter" as a first-class liar who used lies to advance the idea that there were "evil Nazis" hiding everywhere that needed to be brought to justice. Wiesenthal was supported by individual Jews and Jewish organizations; he then created his own organization just for that purpose. Though an establishment figure, Walters has come out with a similar expose of Avey's book. In an opinion piece in the Daily Mail on April 9, 2011, Walters makes the case that "increasing numbers of people don't believe [Avey]." Dr Piotr Setkiewicz, the head historian at Auschwitz, said outright that he did not believe Mr Avey's story of the swap. He added, "As there are no testimonies by other survivors, I certainly would not include this story in any book that I wrote." His fear was "the story could provide ammunition for Holocaust deniers." This is always the worry of those who live off the Holocaust Industry. Note that the concern was not that it was untrue. If the story could somehow pass muster, it would be allowed, but if the lies are so blatant and far-fetched they can be easily attacked, it's bad for the Industry. Remember Herman Rosenblatt's Angel at the Fence? And his fabricated story was far easier to swallow than Avey's. In the same week, Yad Vashem said it was now unable to honor Mr Avey with "Righteous Among The Nations," because it could not back up his claims. The same Irena Steinfeldt, who last year effused over Avey's "noble and extraordinary act," this week said, "We didn't find anyone to confirm it. We went through several testimonies of Jewish inmates, and none of them mentioned that it happened. There was nothing to substantiate it." She pointed the finger at the British Government when she added: "We often get recommendations that show that the applicant has won an honour from a government, but that in itself is not evidence." She's referring to the British "Hero of the Holocaust" Award given to Avey on March 9, 2010 by Prime Minister Gordon Brown. According to the Daily Mail, Avey's name was "put forward to Yad Vashem" as a candidate for the 'Righteous' title." Even Former prisoners at Auschwitz and at the PoW camp where Avey allegedly had been held have strongly disputed that Avey's exploit was possible. Sam Pivnik, 84, a Polish Jew, was sent to Auschwitz in August 1943 and held there until January 1945. "Avey's story seems to me highly unlikely," he says. A stronger rebuke is heard from Brian Bishop, 91, a survivor of Dunkirk who had been captured in Africa in 1942 and was at camp E715. "I don't believe it. I can't understand how he did it. To do something like that you need to have several people helping on both sides — our side and the Jewish side." Bishop sees a further problem in Avey's timing. "Why does he start telling this story now? I don't understand why all these stories are coming out now. It looks like they're waiting for everybody to die and then no one can contradict them." Exactly right. Even Ernst Lobethal's daughter, Ingrid, says she does not believe the story of the swap. "Where is the detail in what he saw there that can't be gleaned from the vaguest Holocaust account?" She doesn't seem to realize that the "details" of most holocaust accounts are also lies. Still, when the daughter of the man you supposedly saved from death does not believe your story, it looks pretty bad. Avey has said he approached British military authorities in 1947 with his story, but they weren't interested. But it has now come out that in 1947, he was approached by American prosecutors via the War Office to ask if he would like to make an affidavit of his experiences to help build a case in a war crimes trial, and he declined. I mentioned previously that the story of Mr Avey's swap is almost identical to that told by another former PoW at camp E715 named Charles Coward, who is one of the posthumus recipients of Brown's 'Heroes of the Holocaust' award. This British Prisoner-of-War allegedly smuggled information about conditions at Auschwitz out and snuck food and other items in to Jewish inmates, and aided the escape of a significant number of Jewish "slave labourers." He lived in Edmonton, Enfield. However, Coward's story has been discredited and his testimony at Nuremberg IMT is now widely considered untrue. A book was written about his exploits, titled The Password Is Courage; he was billed on the jacket as "The Man Who Broke Into Auschwitz" — which became the title of Avey's book. Avey's co-author Rob Broomby has made excuses for the implausibilities in the story and has had to admit that he can't confirm whether the "swap" really happened. "It's very difficult to verify at this stage,' he said. 'You're not going to find people 70 years afterwards. It's only when you've spent time with Denis that you know what he's like." Denis falls back on the same kind of defense. In 2001, 10 years ago, Avey gave a five-hour interview to the Imperial War Museum and did not mention the swap. When recently asked why, he said, "I don't know why. I didn't choose to establish it then. But what I wrote in the book is the truth. I don't have to defend it. I don't mind what anybody says. I know what I've done." Broomby has also said, "This is not footnoted academic history. You have to look into the man's eyes and know what sort of man this is.' In other words, accept the lies in order not to insult the 93-year old man who's telling them. Oh yes, make no mistake, the argument has been made that Avey, as an elderly man, should be allowed to have his glory and not be questioned or doubted. It's the nice thing to do. What kind of historical record does this leave us with? Broomby's role in this makes him part of the conspiracy. Employed by the BBC, he first published an interview with Avey on November 29, 2009, along with the sentimental video produced by the BBC crews. A month later, on Dec. 30, his byline appeared on another BBC article announcing that Avey is being considered for the title of "Righteous Among the Nations" by the Yad Vashem Holocaust Memorial in Jerusalem. In that article, Broomby said that Avey's story was the result of a BBC investigation. Broomby then gets the lucrative job of writing Avey's sure-fire best-seller. Is Britain copying Israel's 'Righteous Gentiles'? This leads to my final point: Gordon Brown seems to have slavishly copied Israel in devising Britian's own "righteous Gentile" award, which he dubbed "Hero of the Holocaust." Though the silver medallion is inscribed with the words 'In the Service of Humanity,' the honor has been described as given to those who risked their lives to help Jews during the Holocaust. Is the Yad Vashem award not enough for the world? "These individuals are true British heroes and a source of national pride for all of us," Brown said in a statement. "We pay tribute to them for the inspiration they provide now and for future generations to come." In picking Denis Avey, and quite a few of the others, he is bringing dis-honor on Britain and arousing only a false national pride. Considering the role of the Holocaust Educational Trust in all this, a clear picture of collaboration between the Holocaust promoters and the British government comes into view, a collaboration which results in the foisting of another fake "Holocaust Hero" onto a world already staggering under the weight of Holocaustism. The sinister purpose, as I said at the beginning, is to bolster the political power base of the World War II allied victors who have become the New World Order. These people engage in telling lies to each other, congratulating one other on these lies, while the media does its part in carrying the lies to the public and repeating them until lies come to be fundamental to our thinking. Positive publicity for Great Britain as the "land of heroes" is part of it also. Why is it so easy to get people to believe this stuff? Many repeat the popular idea that folks don't want to admit they have been fooled by what turns out to be, upon deeper study, obvious fairy tales. Thus they prefer to continue to believe it is true. I think the reason is more profound than that. It's not ego. People instinctively realize that if the Holocaust is a hoax, much else that they have believed, and even cherished, must also be wrong. This turns their world upside-down, and everything must be re-examined. Rather than deal with that, they refuse to think about it. They decline to look at the evidence. This is what people like Gordon Brown and the BBC count on. This is why they feel safe. Can we hope that enough people will be outraged by the fraud committed against us, and the money, our own money, spent to uphold it, that they will be willing to re-arrange their world view? That is the hope. When I first heard about this guy I remember searching back through several iterations of it and there were some glaring inconsistencies that jumped out, even if you had never heard of WW2 you would notice them. Persons mentioned in one version of the story were merged with other people, just like might happen in evolving versions of a script or book. Charles Coward - Breaking into a jewish section of Auschwitz was in his book but the film version never dwelt on this aspect of the story. It was filmed as a British PoW drama (actually a lot of comedy). The concentration camp part of the story doesnt appear at all. First time I saw it I thought it was just a mild comedy, didnt even realise that he was actually a real person. Minor nitpick Carolyn - Brown was never elected PM. Tony Blair stood down in 2007 and Gordon Brown took over, going on to lose the next election 2010. Okay Lurker, I changed it to "following upon his elevation" to Prime Minister. I also made a few other improvements. So thanks for the comments. Yes, this Avey is a piece. He's absolutely thrilled to be associated with Jews. He'll do anything to help them out. Showing what a superior guy he is! But he couldn't have done it without the cooperation of all those other British elites who do exactly the same thing. Another problem with Avey is why did he wait all this time? In one interview he mentions being debriefed by a British officer (after return to the army) who supposedly dismissed his claims about Auschwitz. Yet soon afterwards Charles Coward is a witness at Nuremberg and is taken seriously. So why did he not come forward then? And then Coward's book comes out and still Avey is sat at home saying nothing, supposedly because the army wouldnt listen him. Yet Coward was listened to? Avey gets to play the prophet-without-honour, martyr while the treatment of Coward shows this is pretty false. OK Coward was a more senior NCO and had status as a leader of the British PoWs but Avey knew him there, surely their stories (if they were true) corroborate each other yet Avey stayed out of the whole circus. Corroboration is where most holocaust stories seem to collapse of course! Each eye witness testimony is a stand-alone, none of them seem to mesh with each other. Common factors are always ythe vaguest ones or the least significant. I know by now that anyone who ever set foot in Auschwitz saw Dr Mengele, frankly one wonders how he had time to eat or sleep, let alone commit any atrocities as he must have been marching around 24/7. I suspect that the whole holocaust story could be undermined using more than officially endorsed survivor testimony. Incoherent, lacking in understanding, ignorant, uninformed ... all these words apply to you, true. Why do you bother to write if you can't make sense? The BBC - British Brainwashing Corporation! I have only just woken up to the Holo lie, what a shock. The BBC perpetuate all manner of lies and manipulation, fear mongering. The Ripple Effect - 7/7 proves the BBC are a government controlled agancy. Tony Rooke won his case in court against BBC TV Licensing, he refused to pay on the grounds that the BBC had prior knowledge about 9/11 attacks - they reported tower 7 collapsing 23 minutes before it actually did! And it saddens me greatly that people still trust in 'auntie BeeB' post Jimmy Saville scandal - if they think he was a lone murderous pervert prowling the BBC studios at night with no protection.... Santa Claus just entered the room! ONCE YOU START FROM THIS PREMISE, THE SKY'S THE LIMIT!